Why Attend Cultural Awareness Training? Our workshops are designed to up skill participants, and impart a deeper understanding, respect and appreciation of Aboriginal and Torres Strait Islander cultures and peoples. Our objective is to help participants better understand how to engage Aboriginal and Torres Strait Islander peoples and appreciate the benefits of a culturally diverse workforce. Murumal’s Aboriginal Cultural Awareness Workshops are designed with specific learning outcomes which can be customised to meet the needs of your organisation. We facilitate a range of topics within Aboriginal and Torres Strait Islander cultural through training, audio visual, group activities and group discussions. The workshop is divided into five chapters: introduction, people, history, future and invitation. Begins with Acknowledgement of Country and focuses on creating a safe learning environment to encourage participants to feel comfortable engaging in activities and discussions throughout the program. Discuss in depth Aboriginal and Torres Strait Islander culture, customs and traditions. Participants develop a deep understanding of Aboriginal and Torres Strait Islander people’s connection to land, community and spirituality. Explore significant moments in history which impacted on Aboriginal and Torres Strait Islander people, land, and culture. Participants will learn about key policies and events which changed Aboriginal and Torres Strait Islander Peoples. Examine Government strategies that aims to reduce disadvantage among Aboriginal and Torres Strait Islander people with respects to Closing the Gap. In addition, Participants look at their organisation’s policy and key priorities targeted towards Closing the Gap. Participants are encouraged to continue learning about Aboriginal and Torres Strait Islander histories, peoples and cultures. Benny was a fantastic facilitator! The training was fun and engaging and I learnt so much about the importance of culture and to not fear talking to Aboriginal and Torres Strait Islander people. An excellent trainer and incredibly thorough in assisting us to consider how we engage with Aboriginal and Torres Strait Islander communities. I would love to run something like this for our teams on a site level. This was an eye opener. Highly professional presenter. Material was outstanding, great conversation and participation from the attendees. Want to be notified of future workshops? Want to book training for your team? 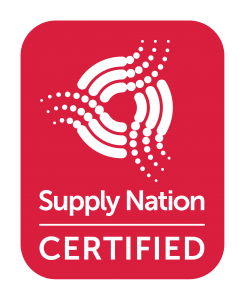 A business or enterprise carrying the NSWICC Assured logo has met National Policy requirements as upheld by the First Australians Chamber of Commerce and Industry (FACCI) for being identified as a First Nations Business Owner or Entrepreneur.